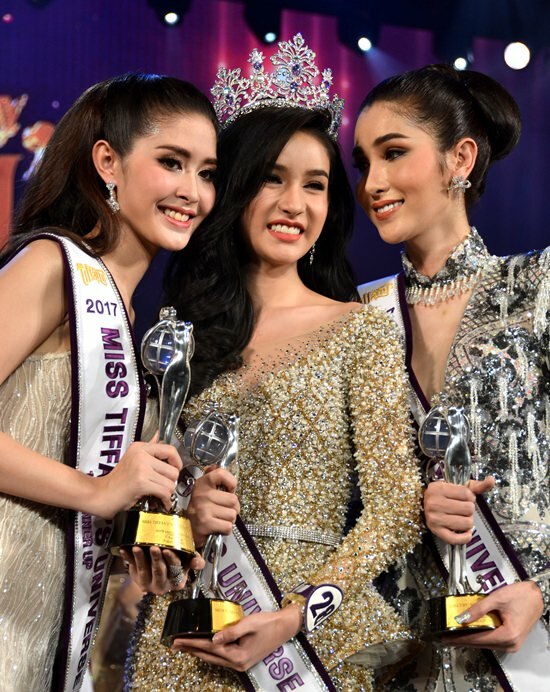 ‘Yoshi’ Rinrada Turapan (center), wearing the 2017 Miss Tiffany crown, poses with first runner-up Kwanlod Rungrojampha (left) and Pimpasa Panupawinchok during the beauty pageant grand finals night at Tiffany’s show theatre in Pattaya, Friday, August 25. ‘Yoshi’ Rinrada took home 4 top prizes at the recently held 2017 Miss Tiffany transgender beauty pageant, battling for the crown against 100 other contestants. 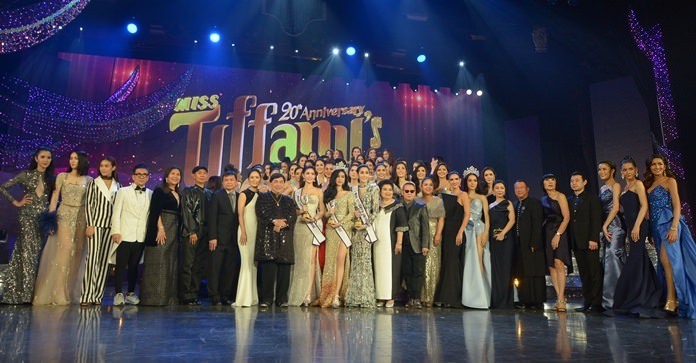 This year marked the 20th edition of the Miss Tiffany event and was celebrated in grand style on August 25, with major media companies such as the GMM25 being present on finals night to stream the live footage throughout the nation. 21 year old ‘Yoshi’, or Rinrada Turapan, is currently studying communication arts and radio broadcasting at Bangkok University and took the crown this year through her good looks, attitude and personality, which obviously pleased the judges. ‘Yoshi’ took home a Mercedes Benz GLA 200 which she gets to use for a year, 120,000 baht in cash and many more prizes. She also took three other titles including Miss Best Costume, Miss Photogenic and Miss Silky Skin by Asoke Skin Hospital, which netted her another 250,000 baht in prize money. The first runner-up was Kwanlod Rungrojampha who won 100,000 baht in cash and a 50,000 baht gift voucher from sponsors while the second runner-up was Pimpasa Panupawinchok, who took home 70,000 baht prize money and 30,000 baht in sponsors’ gifts.